They just want you for your body, but which wants it more? The war between Apple and Google doesn't stop at smartphones and wearables; the two also want to be your health guru. Apple Health and Google Fit are both vying to be your fitness platform of choice, and with Android Wear 2.0 and streamlining updates to the Apple Watch and iOS, both are much more refined experiences. Originally, Google Fit was a software framework allowing app developers and hardware makers to record, log and display health-related data with as little coding as possible. But it left the developer labs at the end of 2014 and is now a fully-fledged consumer-facing offering. Since then it's grown into a proper fitness app that doesn't just track your steps and workouts, but is at hand to help during your gym sessions. Apple Health works the same way, sucking in data from all those fitness apps, wearable companion apps on your iPhone and Watch - including Apple's own Watch workout app - and low energy Bluetooth devices and attempts to put the data in one, easy-to-read place. But what are the differences? And is Android or iOS the best for fitness fanatics? Let's compare. Google Fit takes the form of an Android app on smartphones, tablets and Android Wear smartwatches. It's also accessible as a web-based portal. With Google Fit installed on your mobile device you don't actually need additional apps when it comes to the basics. It uses the sensors already built into your Android device to automatically detect walking, cycling and running, and you can set and keep track of goals. Apple Health is built right into iOS and over time has become easier to navigate and understand thanks to some design changes. Apple's iPhones have motion coprocessors built in that collect sensor data from the integrated accelerometers, gyroscopes and compasses, and your phone tracks this data and combines it with the info from other compatible apps and devices. These devices include the Apple Watch, of course. Opening Apple Health on the iPhone, you'll be greeted with four big buttons: Activity, Mindfulness, Nutrition and Sleep. Pretty self-explanatory, and tapping on each will give you an overview of your week's progress. You can also view all your data in the daily calendar view, which makes it easier to digest, while the Sources tab shows you where all your data is coming from (we'll touch on compatible apps and devices a bit later). Google Fit will instead greet you with a chart of how many steps you've made so far that day and how that translates to time, distance and calories burned. It's a nice colourful design, and scrolling down will give you a breakdown of your day's different bouts of activity. You can also see everything in a timeline view, similar to Apple Health's calendar mode, if you prefer. Overall Google Fit has fewer buttons and sections, but still has some features Apple Health doesn't. In terms of features, Google Fit and Apple Health take slightly different approaches to logging your fitness. As we said, in both cases the phone itself will track some basic activities. While Apple Health on the iPhone can track walks, runs and stairs climbed, it takes the rest of its data from your other health apps and wearables. Google Fit does the same, but it also lets you start more activities from the app itself. From Badminton to pushups to running, you can start a session at any moment by tapping the plus icon that hovers to the bottom right of the screen. If you're an Apple Watch user, you can start some workouts from the Activity app on the smartwatch, the data from which will be pulled into Health when the session is over, but these were limited to a small handful involving running, cycling and running. Apple will expand these in watchOS 4, adding tai chi, mixed cardio and hand cycling. With Android Wear 2.0, you can use the Fit Workout app to start a much wider range of activities from the smartwatch. There's also a nifty feature that automatically detects what exercise you're doing in the gym, be it pull-ups or burpees, and it works well. Another thing the Google Fit app lets you do is set targets beyond steps, so you can set multiple goals for exercises like running, aerobics and even beach volleyball. Apple Health only lets you change your calorie goal. It's a shame that Apple Health doesn't let you add custom workouts, as this is one of Fit's best features. It's also helpful as not all workouts on the phone app are selectable on Android Wear, but they'll still feed into your activity history so you can specify what they were afterwards. 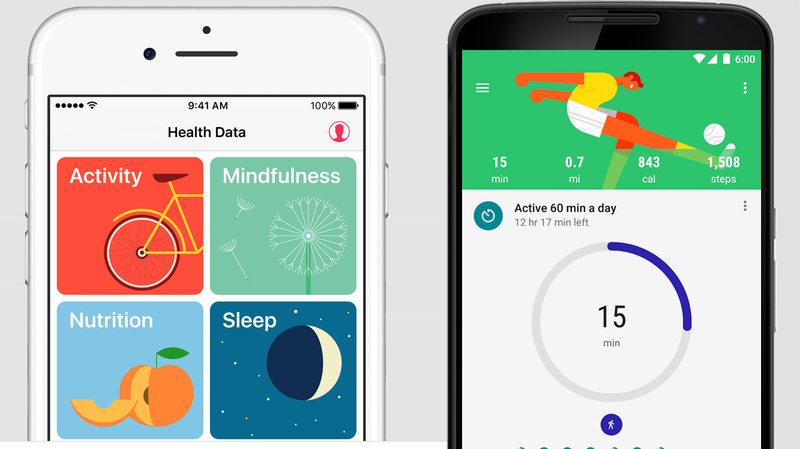 Both Google Fit and Apple Health can plug into your sleep and nutrition apps, along with other apps and devices that measure workouts, but Apple's platform goes beyond Google when it comes to more serious medical data. In the app you can add data on vitals, reproductive health and nutrition. Soon, you'll be able to access diabetes management information, like blood glucose mealtime and insulin support. You can also access your health records if your medical provider makes them available as Clinical Document Architecture files. All in all, Google Fit is more proficient at specific workouts, and may be better if you're looking for something to regularly hit the gym with; Apple Health is better at keeping track of your wellbeing. While Google Fit and Apple Health can track some metrics on their own, they can also pull a lot of their information from other apps and devices you may use. You can take a look at our full list of all the apps and devices that are compatible with Apple Health, and the number has grown significantly over time. For both platforms, in fact; Strava, Withings Health Mate and MapMyFitness all play nice with Health and Fit, feeding workout and nutritional in, as do devices like the Misfit Shine 2 and Withings Aura alarm clock. With the onset of iOS 11 and watchOS 4, Apple Health will also be able to draw in data from Bluetooth low energy devices, like Dexcom's continuous glucose monitoring system. But the big one that still refuses to play nice with either is Fitbit. Given how strong Fitbit's platform is, you can understand why it wants to keep users in, but it would be nice if it did start talking to Fit and Health. When it comes to specifically wearable devices, Android Wear automatically plugs into Google Fit; the Apple Watch, of course, exclusively supports HealthKit. Among other things, the benefit of using a wearable with these platforms is that (assuming they include it, and the Apple Watch definitely does) you have the added heart rate data. As for devices manufactured independently of Apple and Google, it's likely that they'll support both platforms from now on, in the same way that most app developers cater for both iOS and Android - especially with Android Wear 2.0 giving the smartwatch more abilities away from the phone. Which one is right for you comes down to what smartphone you own, and what you look for when it comes to activity tracking. Both platforms have come along way since launch, and there's a lot of parity in terms of what they can do and the others apps and devices they can now talk to. But there are some notable differences too. Namely, Apple Health is more engineered towards overall wellbeing, and for people who have to keep an eye on conditions, it's probably a better fit. Google's platform offers more variation in workouts, however, and with Android Wear 2.0 it's even better at accounting for different types of exercise. All said, even with how far they've come since 2014, both feel like they have a lot left to give. Have you used Apple Health or Google Fit? Let us know about your experiences in the comments section below.